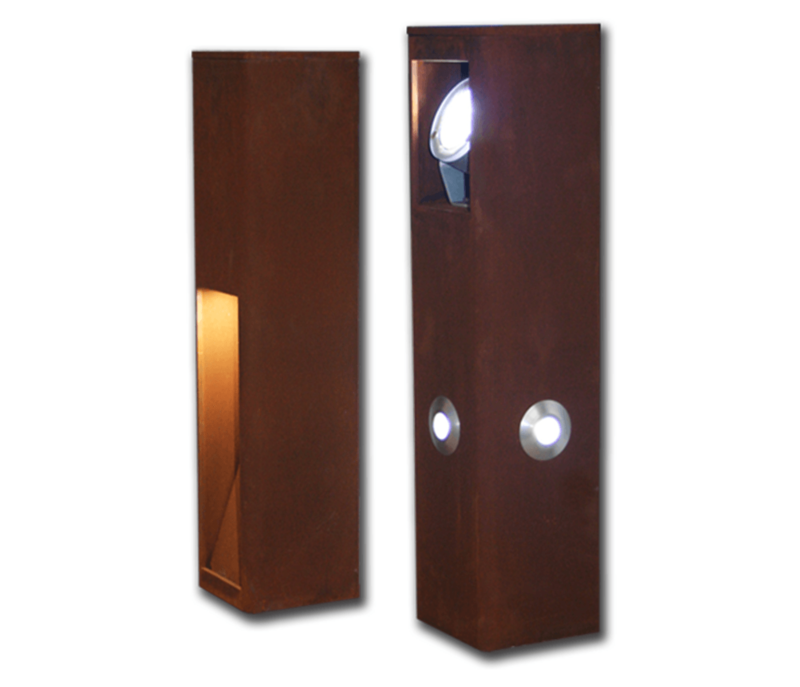 One recent example of a Led-Zip custom designed and built product is our Rusty LED Bollard range. The rustic charm of these bespoke manufactured bollards makes them a very attractive addition to any outdoor area particularly as they are fully weatherproof. Both of these bollards are constructed from solid steel and have been treated with a special oxidising compound to help create the natural ‘Rusty’ effect. The first features a long asymmetrical reflector giving a floor-wash effect from a recessed LED MODULE. The second features 3 Polaris mini LED spots and an adjustable Polyflood 3 LED spotlight at the head, this allows the LED bollard to light low-level walking areas as well as flood a larger area or highlight specific features as required – these have been used to light tree canopies as well as architectural features. They are available in Cool White, Warm White, single colour or RGB and come complete with ground-spike or surface fixing plate. The Rusty Bollard range is an exclusive design manufactured by Led-Zip Lighting, should you have any further bespoke requirement or wish to adjust the design/appearance of either of the bollards please contact us on 01202 577400 to talk this through.